From the mid 70’s to late 90’s Gary Larson drew over 4000 single panel comics in the Far Side series. It’s been a long time since he drew any new cartoons so why are his cartoons still regularly seen in calendars, birthday cards, stuck to refrigerators, desks and office walls around the world? One reason for The Far Side’s popularity could be the combination of black humour (death and disaster were common motifs) and the attribution of human characteristics to insects, snakes and various animals including farm yard animals like Cows. Many runners-up were specific to disciplines. Mammologists: “Animal Waste Management,” bears in hard hats have run their sewage line into a human home; polar bears discussing how igloos are crunchy on the outside, chewy on the inside. Meteorologists: Airline pilots playing with their controls and maneuvering wildly but announcing to their passengers that they are flying into turbulence. In 1994 Larson released an animated short film called “Tales From the Far Side I” and after popular acclaim a slightly longer sequel in “Tales From The Far Side II”. These films take audiences on a strange and twisted journey through the unique landscape of the comically scientific and strangely ironic musings of Gary Larson. 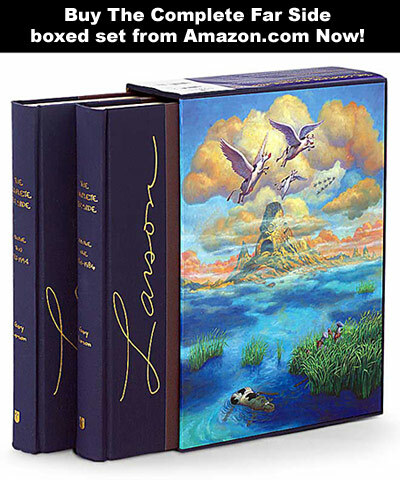 Long-time Far Side fans will recognize their favorites and newcomers to Larson’s land of The Far Side are sure to find someone, or something, to love. The films are an animated collection of vignettes (12 in Tales I and 16 in Tales II), each featuring its own storyline and panoply of Far Side characters, including mad farmer scientists, zombies at a Dead Ranch, time machines, swamp fairies, partying amoebae, devious zoo inhabitants, beer-guzzling hunters, beer-guzzling aliens, dog soldiers, insolent cats, a vacationing Grim Reaper, and of course, cows. I actually liked “Tales From The Far Side II” (45min) even better with its fantastic idea of following the disasters which occur around personification of death while he enjoys his vacation, however as far as I can tell it’s not available on any video sharing websites. On an interesting side note: Gary Larson threatens his fans with cease and desist letters if they show even 1 of his comics on their website, even if their article is about how much they love Far Side and how other people should check it out. I love the Far Side. The twisted sense of humour and one panel jokes are one of my fond memories growing up. I Love Far side, they make my day start with a laugh! Wonderful. I think I have every Far Side book (didn’t see the films, but hope to find them on video). Took a look at Londons Times Cartoons and have to agree with Alexa; though not all of them can compare to The Far Side, admittedly some are as funny if not more so to me; some not as good. In any case there are thousands so I bookmarked the site. Very decent funny stuff. I predict the next Far Side but who knows. I love far side…. i it makes me laugh…. and i love laughing… im sad that they have stopped making the Far Side… but i love the ones that i have read. I really love the one that has the kid pushing on the pull door…. Priceless…. My favorite was the cockpit shot of two pilots in what is evidently a commercial flight, where one says to the other “Say, what’s that goat doing up in that cloud.” You can see it out the window. Another priceless one…how did he do it? I love the Far Side. My uncle got me into it after sending me Far Side birthday cards every year! I have always been a fan of Far Side. As long as I can remember I would check the comic section of the paper and go straight to it. I think I need to start collecting the books. The Far side is great. I also love Kerou . He does single panel cartoons also. Check it out at http://www.kerou.net I think he could be the next big thing. The cartoons are very thought provoking and funny. When The Far Side ran in our local paper I used to always read it before any of the news. I will always think of the snake stuck in the bird cage because of the bump in his belly lol. i love far side, i read ’em when i was little, and i have read ’em ever since! I love it that’s why I download it using Torrent Search Engine.. The torrent AVI version of Tales From the Far Side I can be download through Areze. does anyone have a copy of the far side 1 and 2 dvd for sale in australia. i have tried everywhere. Previous PostPrevious Is First Home Buyers Grant Really A Sellers Grant?